The Duck is located on the same bluff as Frisco Heights, a bluff carved by Tenmile Creek, which runs at the base of it, now several feet below. Views and the location are both a plus to homes for sale in this high-end Frisco neighborhood. Maybe it was called the Duck because you might see ducks in the quieter eddies of the creek. Homes for sale in Frisco Duck will all be newer, the oldest one built in 1997. A handful are duplex homes, and the remaining dozen are single family homes, usually more than 3,000 sq.ft. on lots more than 1/4 acre. About 1/10th of the lots are undeveloped. Check out the Frisco Duck Real Estate Listings found below, or continue reading about this picturesque community in Frisco! The location is stellar, with great views and easy access to Main Street or Summit Boulevard and the bike path. The countywide bike path runs along Ten Mile Creek. A short pedal from the neighborhood one can be rolling around the edge of Lake Dillon and seeing the boats out in Frisco Bay or clinging to the marina in winter. 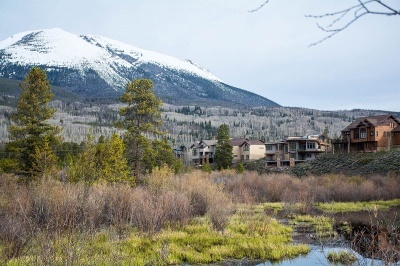 Frisco is at the center of Summit County, and from it all the four ski resorts in the county are easily assessed by road, or by free public transportation. Vail, in Eagle County, is 25 miles away, and Denver only 75 miles to the east. 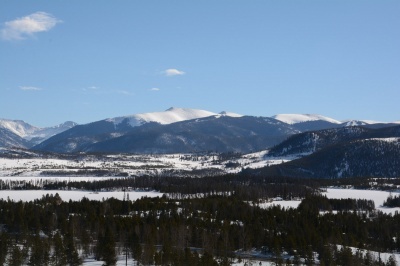 Frisco has a tubing hill, the best cross country ski touring center in the county, winter sleigh rides, tennis courts, bike terrain park, and the Frisco Marina on Lake Dillon. The easiest way to reach the Frisco Duck subdivision is to head north from the roundabout at I-70 to School Road. Turn right on County Road 1040, and right onto Shoshone. When you arrive at any street named Mallard, you'll be in the Duck. Any questions? Don't hesitate to contact Breckenridge Associates online or call (800) 774-7970 or (970) 453-2200 to reach an experienced local real estate expert.